Dalkey Archive Press, 9781564782380, 177pp. Folks. This here is the story of the Loop Garoo Kid. A cowboy so bad he made a working posse of spells phone in sick. A bullwhacker so unfeeling he left the print of winged mice on hides of crawling women. A desperado so onery he made the Pope cry and the most powerful of cattlemen shed his head to the Executioner's swine. 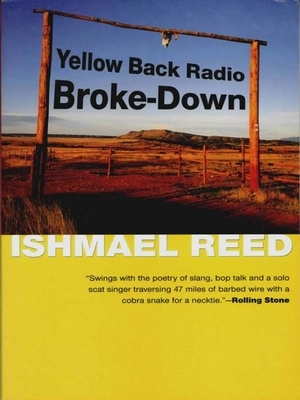 And so begins the HooDoo Western by Ishmael Reed, author of Mumbo Jumbo and one of America's most innovative and celebrated writers. Reed demolishes white American history and folklore as well as Christian myth in this masterful satire of contemporary American life. In addition to the black, satanic Loop Garoo Kid, Yellow Back Radio Broke-Down features Drag Gibson (a rich, slovenly cattleman), Mustache Sal (his nymphomaniac mail-order bride), Thomas Jefferson and many others in a hilarious parody of the old Western.